Campaign funding: Holdorff Polhill has raised $78,766 and spent $64,810 as of Jan. 21. An independent expenditure committee called the Parent Teacher Alliance, which is sponsored by the California Charter Schools Association Advocates, has spent $102,338 to support her, and a UTLA-funded independent committee backing Steve Zimmer and Imelda Padilla has spent $37,768 opposing her. 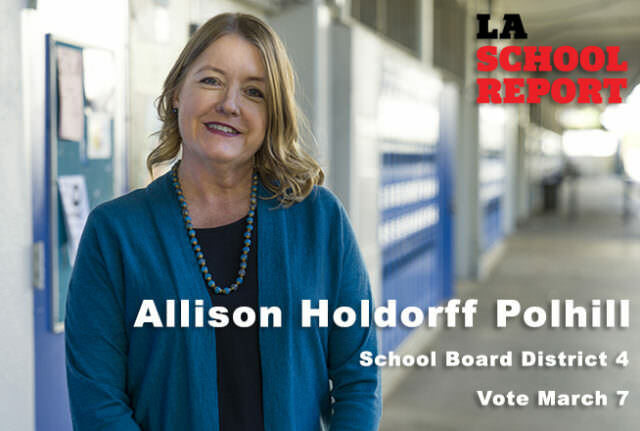 Allison Holdorff Polhill is hoping to bring her experience running the board of Palisades Charter High School to a much bigger stage at LA Unified. She is one of four candidates for the District 4 school board seat on the March 7 ballot. She is running to unseat incumbent Steve Zimmer, who is the board president and seeking his final term. Nick Melvoin and Greg Martayan are also running. Holdorff Polhill spent six years as an elected member of the governing board at Palisades High, including board president. She is a mother of three who attended their local public schools: Palisades Charter Elementary School, Paul Revere Charter Middle School and Palisades Charter High School. She also served on the boards of the elementary and middle schools. She said once her children attended school, she became devoted to their education and became an active member of the school community. The LA Unified seat represents the communities of Brentwood, Del Rey, East Hollywood, Encino, Hollywood, Mar Vista, Marina Del Rey, Pacific Palisades, Playa Del Rey, Playa Vista, Tarzana, Topanga, Westchester, West Hollywood, Westwood, Woodland Hills and Venice. If no candidate receives more than 50 percent of the votes, the top two vote-getters will advance to the general election on May 16. 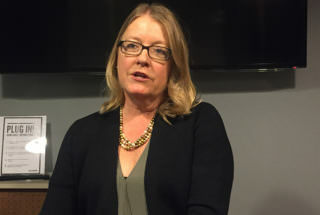 Holdorff Polhill said while she was working for the California Charter Schools Association as a parent organizer last summer urging people to get involved in the District 4 race, people encouraged her to run for the seat. She said the timing was right for her because her youngest child graduated high school in the spring. “I’m jumping into the race because it’s urgent. And these things have to be taken care of as soon as possible so we can help these kids,” she said. Her priorities are to unify the board to be “student-focused,” support all successful educational models, and fix the budget. She said that running against an incumbent does not intimidate her. Holdorff Polhill was raised Yucaipa in San Bernardino County and attended public schools. Her father didn’t complete high school and worked as an auto mechanic. Her mother attended college. She said a teacher encouraged her to join speech and debate, which inspired her and opened up a new world from her humble background as she was able to travel to Boston and Washington, D.C., for competitions. She then went on to UCLA and Loyola Law School. She has practiced environmental law and taught speech and debate at Pali and ethics and human communication at Woodbury University in Burbank. While on the board at Palisades, she oversaw a $30 million budget and 3,000 students. LA Unified’s budget is $7.6 billion and the district has more than 664,000 students. She also worked to have the school provide transportation for Pali students when LA Unified stopped providing buses. The school’s students live in 100 different ZIP codes. Holdorff Polhill describes herself as a “happy warrior” and said she can reach out to all sides and bring them together to discuss issues and come to an agreement. “My sole goal within the first few months would be to get everyone together,” she said. To increase achievement in all district schools, Holdorff Polhill said she would “advocate to support teachers by maintaining low class sizes, increasing professional development, and ensuring ample resources are available in the classroom.” She would also implement programs to identify “at risk” students, to educate parents so they can help their kids, and to help middle school students be successful in high school. To help students most in need and to lift scores at the lowest-performing schools, she would ask for a specific plan for each school and place each school on the board’s agenda every month until the board was satisfied it was no longer low-performing. She noted that over a quarter of the funds allocated for each student’s Average Daily Attendance (ADA), about $2,700, does not follow the student to the school site, but rather goes to paying for liabilities for those no longer working in the district. To do so, she would form a committee comprised of UTLA representatives, all stakeholders and financial experts, as she did for Palisades High, make sure the issue is on each month’s board agenda and set specific goals and timelines to monitor progress with the superintendent. Palisades High’s teachers are part of UTLA, and Holdorff Polhill said she helped craft a new contract with the union under sometimes contentious circumstances. Holdorff Polhill said the board needs to end its fight of “us vs. them” with the charter school movement. “There’s a lot of rhetoric where those who are trying to help in education are being painted as people who have hidden agendas other than to help students,” she said. She said one of the tensions for co-located schools is transportation. She suggests “a hard look at alternatives like more car pooling and scheduling considerations,” and perhaps establishing a liaison who can help facilitate communications with the district.